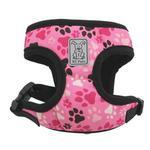 Get out and enjoy the summer days with added style in the Cirque Dog Harness by RC Pet Products in Pitter Patter Pink! 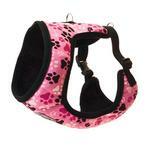 Your dog will look more fashionable than ever while staying secure and comfortable. The breathable air-mesh fabric is soft and comfy. The soft neckline eliminates pressure points. Made with a breathable air mesh fabric covered in a printed spandex. This over-the-head style harness features and adjustable girth with a quick-snap buckle for easy attachment and removal. Two nickel-plated D-rings offer a higher level of guidance, especially when paired with a coupler leash. 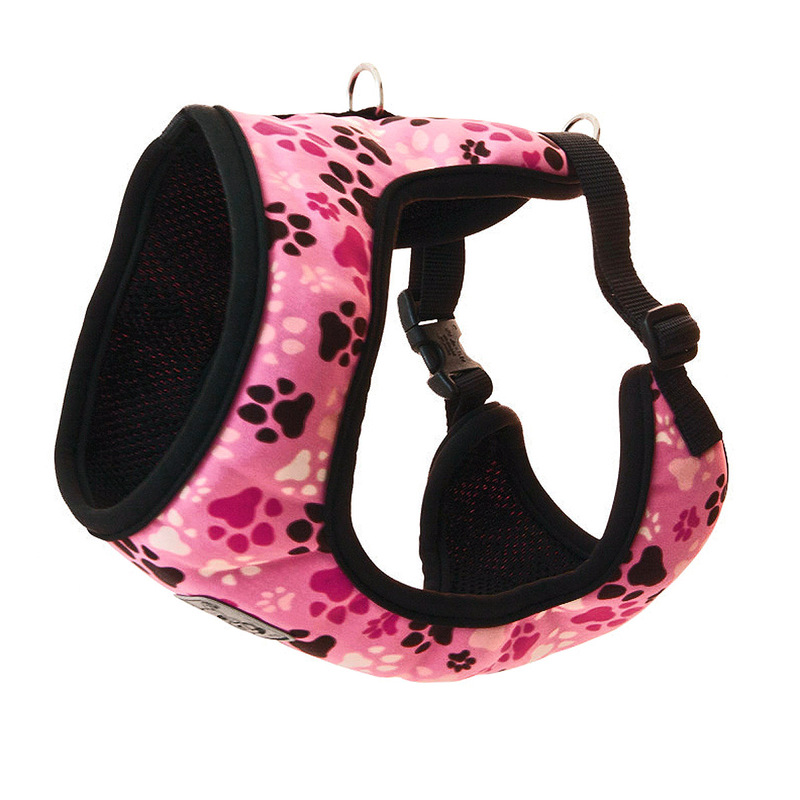 We love the cheery pink paw print pattern on this harness that pairs fashion with safety. This harness features a comfortable choke-free design that makes walking a pleasure. Machine wash cold on delicate cycle. Do not wash with touch fastener items. Hang to dry. Do not iron, do not bleach, do not dry clean. If needed, pre-soak in an enzymatic cleaner like Nature's Miracle. Check out matching collars, leashes and coats sold separately. 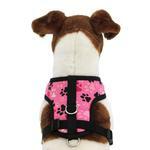 Cirque Dog Harness - Pitter Patter Pink Customer Photos - Send us your photo! She is 3 years old and loves to snuggle. Loves getting her picture taken and is truly my best friend?? Posted On 01/07/17 by Carrie M from Goodyear, AZ Yes, Carrie M recommends this product! Fit is fine. I am wondering about the placement of the D ring on the back since it is way back and tends to pull. Otherwise, all good. Posted On 09/10/16 by Deanna L from , Yes, Deanna L recommends this product! Posted On 03/02/16 by Rononda L from Norwood, NC Yes, Rononda L recommends this product! My Shih Tzus love going for walks with these new harnesses - no pulling on the neck area - the D ring is set on the back so it takes the pressure off the neck when they want to go in opposite directions! They weigh 18 lbs so I went to the Large size in this harness as opposed to the Medium I usually buy in Puppia brand. Love this company! They are always so helpful, have great quality merchandise and very fast service! I do wish I could enter more than one certificates at a time for payment. Had to use credit card for balance instead of another certificate.